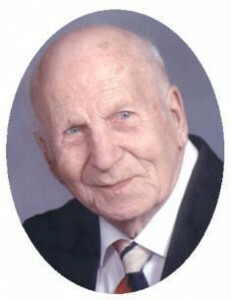 Norbert L. Augustin, 94, died Sunday June 3, 2012 at his Harbor Club residence in Port Washington, Wisconsin. He was born March 29, 1918 in Port Washington to George and Anna Ellermann Augustin. He attended St. Mary’s School and graduated from Port Washington High School. In 1942 he entered the U.S. Army and served in the 252nd Field Artillery Battalion in Central Europe working on the wire crew, laying telephone lines between batteries and headquarters until his discharge February 6, 1946. He Returned home and started working at Bolens Products in Port Washington, where he met Marie Buchholz. On May 17, 1947 he married her at St. Joseph’s Catholic Church in Grafton. He worked as a machinist at Bolens for over 42 years retiring in March of 1980. They raised their family on W. Main Street in Port Washington and later moved to N Webster Street. Marie Preceded him in death October 29, 2010 and more recently he moved to the Harbor Club. Norbert was a member of the International Association of Machinist, Local 1430, a 55 year member of the St. Mary’s Usher Society and a life member of Ozaukee Memorial Post 5373 VFW. He helped honor veterans by serving in the VFW honor squad at many funerals. Norbert enjoyed woodworking and built furniture for his home and his children’s homes including dining room hutches, curio cabinets, bedroom sets and various smaller pieces of furniture. He is survived by his children Gerry (Donna Rae) Augustin of Enid, Oklahoma, Judy (Neil) Thill of Fredonia, Bob (Sandy) Augustin of Hewitt, Wisconsin, Frank (Lisa) Augustin of Krakow, Wisconsin, Rita Thompson of Sierra Vista, Arizona, Laurie Augustin of Port Washington and Donna (Bill) Miller of Derbyshire, England; twelve grandchildren and ten great-grandchildren. Further survived by brother Leonard (Harriet) Augustin of Port Washington, sister-in-law Clarice Buchholz of Grafton, nieces, nephews, other relatives and friends. He is preceded in death by his wife Marie, brothers Joseph, Leander, Ruben and Fred Augustin, sisters Mary Bahr and Bernice Possley and great grandchild Chance. The Reverend Thomas Lijewski will celebrate Mass of Christian Burial 6 pm Tuesday, June 12, 2012 at St. Mary Church, 430 N. Johnson Street, Port Washington. Interment parish cemetery. Visitation 3:30 – 6 pm Tuesday, June 12, 2012 AT CHURCH with a 3:30 pm rosary. Memorials to St. Mary Church appreciated.